Darren Clarke confessed that his obsession with practice has left his game is in disarray. The Ulsterman, 40, crashed out of the US Open at Bethpage Black as he finished on 10 over par. After a second round 76, Clarke groaned: “My game is absolutely c**p. I drove it really, really poorly and you can’t do that in a US Open. Clarke was hoping to warm up for 12th US Open appearance with a trip to the Austrian Open. But the postponement of that event wrecked his plans and he paid the price with a sloppy performance that saw him hit less than half the fairways and greens. After a first round 74 he was already heading out of the tournament when he slumped to nine over after 12 holes of his second round on Friday night. The world No 101 will be back in action in Paris in two weeks when he plays the French Open before building up to the Open at Turnberry with a trip to Barclays Scottish Open at Loch Lomond. Darren Clarke hopes a change to his putting style will give him a grip on the Claret Jug. The Ulsterman, 40, will be teeing it up in his 18th Open using the 2-Thumb fat grip made popular by Miguel Angel Jimenez and KJ Choi. 2-Thumb Clarke at TurnberryClarke changed to the new-fangled putter after watching Nick Dougherty in action in Paris two weeks ago and knocked in putts from all angles in last week’s Scottish Open. Believing it could be the key to a Turnberry triumph, Clarke said: “I played with Nick Dougherty in Paris and I was talking to him about it and he was putting lovely and I thought I would have a go at it and it was very nice. “I used it last week at Loch Lomond and it really takes the hands out of putting and makes it more of a stroke. 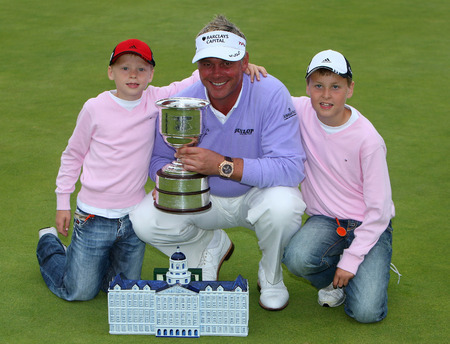 Darren Clarke will clock up a major milestone on Friday when he celebrates his 41st birthday. What he didn’t know yesterday is that this week’s US PGA Championship will be his 50th appearance in a major. Life can put golf in perspective at times and and that was certainly the case for Darren Clarke and Phil Mickelson in the 91st US PGA at Hazeltine National. Clarke and his sons in happier timesBehind the golfers who missed fairways and greens, three putted and generally suffered the slings and arrows of outrageous fortune are two family men trying to do the best they can. Clarke “celebrated” his 41st birthday yesterday in the saddest way you could imagine, adding a four over par 76 to his opening 78 to miss the cut by some distance on 10 over. With both his wife and mother recovering from breast cancer surgery, Mickelson had to dig deep to card a second successive 74, which was just about good enough to make the halfway cut on the four over par limit. Darren Clarke reckons a happy home is the secret that could unlock to the door to major championship glory. Darren Clarke is convinced that Rory McIlroy has the talent to surge ahead and win the Open from the front.